He said that taking even one day off and eating significant carbs (presumably >50g) will cause you to cease being in a keto-adapted state. I can't imagine “falling off the wagon” in a couple of months and eating a piece of cake one day, only to find myself at the bottom of the sugar hill once again, with several weeks required to recover keto-adaptation. Have you seen any other research on this? Come on, Steve, give me a license to cheat once in a while!! A:I believe that you DO have such a license. While I certainly respect Dr. Phinney's experience-based knowledge and research, it is difficult for me to see how an adaptation to a fat metabolism, which required a full month to complete, could be undone in a day. And, in fact, about a week ago, I experienced hunger. Now, that sounds a bit weird, I know. But this state of ketosis is SO different that you very quickly forget what hunger felt like! When it returned I thought: “Wow! I feel hungry! I haven't felt that in a few weeks! How weird!” But the hunger it only persisted from the time I awoke until I ate some (ketogenic) breakfast and the hunger was completely banished once again. Looking back on that, I now believe that I MUST have briefly dropped out of ketosis. Hunger appears to be SO thoroughly suppressed when in ketosis that experiencing ANY hunger becomes synonymous with “not in ketosis.” Now, if I dropped out (as I think I must have), it probably wasn't very far out, since I slipped right back in. I mean . . . I didn't have any “jumbo stack of pancakes smothered in syrup”. But I must have allowed SOME carbs to sneak in inadvertently perhaps during dinner the evening before. I DO know that Dr. Phinney mentioned during that video that he had been in and out of ketosis a few times experimentally. Perhaps he was testing exactly this. And I have planned to do the same, eventually. One last thing I'll say is: For ME, at least, the absolute suppression of any sense of the need to eat is SO VALUABLE to my state of mind, my peace of mind, and the state of my day, that I CAN, without question, choose NOT to jeopardize this condition voluntarily. Who's EVER going to actually FORCE you to eat something that you don't wish to? If you're somewhere without ANY safe low-carb eating options, simply choose not to eat anything “bad” becomes a VERY simple option. Today, for example, I'm not eating anything all day — except for the bouillon to get some water and salt — just to experiment with seeing how the day goes, and whether I can push this. I exercised and felt great. And I'll be a bit thinner tomorrow . . . when I guess I'll eat, since I really don't want to waste away to nothing! But the honest-to-God feeling is that eating becomes something you CHOOSE to do, rather than NEED to do. Oh my Lord is it empowering and freeing! A:Cheer up! . . . Or perhaps I should say “Cheers Up!” I was worried/wondering about this too. But the good news from many people with much more experience “doing” low-carb than I yet have (in other words, thousands of Atkins, South Beach, Zone, etc. dieters, in addition to low-carb researchers) is that alcohol in moderation does not count against us in the same way that glucose-based carbohydrates do! What happens that that when dietary alcohol enters our blood stream it is metabolized preferentially by our liver. During this time, all ketone production and fat burning comes to a halt. But nothing is “reset” by this. We're not thrown out of ketosis. It is just briefly suspended until all of the alcohol has been dealt with. Then our livers pick right up where they left off with chopping long-chain fatty acids into smaller ketone bits to feed our muscles and brain. Note, though, that anything else added to the drink to sweeten it—like sugary Margarita mix added to the Tequila—definitely counts against your daily carbohydrate intake. On other thing, though! Everyone who has consumed alcohol while in ketosis reports that they “are a very cheap date!” In other words, alcohol during ketosis has a much stronger intoxicating effect. From my own controlled experiments with Heineken Light beer, it appears to be at least two times stronger, since I got a definitely surprisingly buzz off just one Heineken. Normally it takes at least several. So . . . please be careful and keep that in mind too! Q:Steve, I heard your Sugar Hill podcast and I am sold on it! I ran across Ketone Raspberry supplements and I want to know what you think about them. A:Whatever “Raspberry Ketone Supplements” are, the fact that they have the word “ketone” in them is merely coincidental. (“Ketone” is a chemical term for a LARGE family of molecule types.) In other words, while “Raspberry Ketones” may indeed be bursting with their ketones, they have nothing whatsoever to do with the “ketones”—of the same name—that our livers produce whenever fat is being metabolized. Therefore, my not-fully-informed take would be that “Raspberry Ketones” are likely pretty much like any other “weight loss supplement”. Maybe it'll work, maybe not. But don't allow the “ketone” term to bias you toward them. Q:Isn't this the same thing as what people call the "paleo" diet? A:Unfortunately, “Paleo” simply refers to a period about two and a half million years long in our early pre-history. So it means “caveman” more than any specific diet. Many people (perhaps most) take “Paleo” it to mean low-carb and HIGH-PROTEIN. This results in people eating a great deal of protein to replace the calories lost from carbs. But since dietary protein consumed in excess of our body's short-term requirements will simply be converted into glucose and burned just like carbs, excess protein can keep people out of ketosis, or kick them out if they were in. And one of the great unknowns is how much wild animal meat early man actually managed to consume. Arguably, early man may have spent a great deal of his time chasing down animals that had a great incentive, themselves, to stay alive. The bottom line is that what we're talking about on the podcasts and on these pages is a low-carb HIGH-FAT diet, where only enough protein is consumed to meet our body's immediate daily needs (which is about 0.6 to 1 gram per pound of body weight). People consuming a lot more than that, over time, report not feeling very well. Q:Hi Steve, I've enjoyed your recent talks about your discoveries with the low-carb diet on TWIT. Thank you for all of the information. I have a question regarding weightlifting on a low-carb diet. Do you think it is possible (or advisable) to eat a low-carb diet while trying to gain muscle through weightlifting? I am currently trying to reduce the amount of carbs I eat, and it seems to be working well. I am trimming down quite well. My problem is that I feel that the reduced carbs are affecting my ability to get a good workout. Both my weight and strength have dropped slightly. I feel like I have less energy while working out. I typically work out in the gym 4 days per week, for about 1.5 hours, and work quite hard. I don't think that I am quite in ketosis with my current diet. Do you think ketosis would help or hinder my goal to gain strength? Thanks in advance for any insight. A:The single best reference for low-carb performance, weight lifting, body building, etc. is “The Art & Science of Low Carb Performance”. But the sluggish way you are currently feeling is absolutely to be expected. You really need a minimum of about one month to become fully “keto adapted”. It hasn't yet even been 4 weeks for me! Your body currently only “knows” how to metabolize (burn) sugar (glucose from carbs) and there's truly a learning period while your body assembles an entirely new set of energy metabolizing enzymes to allow it to burn fat. So this creates an “energy valley” that you are in right now, where you are deliberately denying your body the one type of fuel that it is presently proficient at burning, while forcing it to develop a new ability to burn a new fuel—fat—that it has never before really needed to be very good at. There is no way around “the adaptation blues”, other than to just plow through. But once your body “switches”—and it would rather just wait for more sugar to arrive so it's dragging its heels—you will find an entirely new realm of performance opening up to you. That book (linked above) is $8.95 from Amazon . . . and I imagine it'll give you all the incentive that you need! Q:One thought occurred to me while considering all you've said and written here: What would happen if everyone changed their diet to a low carb diet. 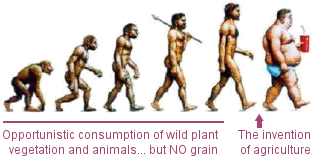 OK, I know it wouldn't happen, but how would we ever feed the 6+ billion people if we did all change to this diet? I don't think it would be possible. A:I'm sure you're right. We are well past the point where we could possibly return our agricultural square footage to low-starch high-cellulose (thus much lower calorie) crops like lettuce and high water content vegetables. They don't begin to contain sufficient calories to feed an increasingly hungry planet. If you want something else to think about, consider that some experts are saying that we only have about fifty years worth of topsoil remaining. Our current high-tension agro farming methods are apparently tearing up our soils and we're running out fast!